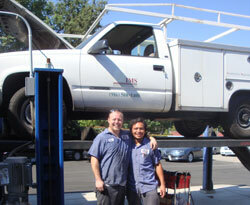 Just like we provide top quality auto repair in Sacramento, the talented mechanics at OK Tire and Automotive are happy to take care of all your auto fleet services Sacramento, CA as well! We provide a full-range of auto fleet repair and auto fleet maintenance services to help maintain your businesses vehicles so they stay on the road longer. And because we sell all major tire brands and perform complete tire services, including alignments, we offer the total convenience of one-stop shopping for your Sacramento fleet. FREE Vehicle Pickup and Delivery with Our Fleet Service! At OK Tire and Automotive, we understand how important your fleet vehicles are to the success of your business. That's why we offer a FREE fleet vehicle pickup and delivery service! We will pick up your fleet cars or fleet trucks, perform all necessary auto repairs and auto maintenance services, and then deliver your vehicles back to your business so you don't miss a beat. We are dedicated to make the fleet repair process easier than ever before, so you can get back to taking care of your customers in Sacramento! Ask about our Employees Too discount program!